This is my learning log for TAOP Assignment 1, Contrasts. The assignment asked me to make 8 pairs of photos, with each pair illustrating a contrast chosen from a pre-defined list of 20 different contrasts, such as “large/small”, “high/low”, “light/dark”, and so on. Additionally I was to make an extra photo, illustrating one of the contrasts in a single picture. I started by thinking about what I thought would be the easiest of them all, namely “large/small”. It was going to be easy. A German Shepherd is definitely large. But compared to a car, it’s actually quite small. So I had to find a large car to shoot. But hold on, compared to a house, a car is fairly small. A house is small compared to a tower block, which is small compared to an oil tanker. But an oil tanker is still not large, compared to a city, a county or the ocean. So I gave up finding something that was inherently “large” and realised that each of these different adjectives or qualities only really have meaning when compared against their opposite number. While I could then have just picked two things with one being smaller than the other – a German Shepherd and an oil tanker, say, I thought this wouldn’t really bring the point home. So I decided to make pairs of pictures where there is something connecting them (for instance, they’re both pictures of a dog), and that something is what shows the contrast. Like a German Shepherd (large dog) and a Chihuahua (small dog). Actually, I wish I had thought of the dogs 9 months ago! Some of the ideas I came up with were very obvious, but there were others where the connection between the images were maybe more tenuous. So when I had my 16 pictures completed, I asked some friends to have a go at pairing them up and see if they could figure out which contrast each pair was meant to illustrate. The results of this little informal test surprised me positively: Most friends got the majority of pairs “right”, and each pair was “successfully” identified by at least one friend. In the explanations below about the logic I used for each pair, I have retained the original picture numbers from the blog post my friends commented on. It means the pictures do not come numbered sequentially here, but it makes it easier to compare my thoughts to how the pictures were seen by other people. I think a lot of the learning from this exercise is precisely through such comparisons. Many of the pictures draw on lessons learnt in the TAOP exercises completed prior to this assignment, and many have been documented in individual blog posts. Where that the case, I have added a hyperlink to the relevant blog post. Each of the pictures is also hyperlinks that will jump to a larger version of the picture. The complete set of larger pictures is on this page. This was probably the most tenuous of all the pairs, and it was the only pair that only one friend got “right”. Steve even got as far as matching all the other pictures and all the other contrasts, and then concluding “[…] which has left me with your cucumber close up, and the bowl of salad, which don’t really fit straight/curved, which means I’ve gone wrong!” Well, you were right, Steve. 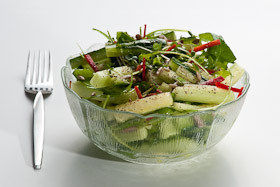 The common theme of the two pictures is “cucumber”, and in the salad they have been cut into identical, straight sticks. So the salad represents “straight”. 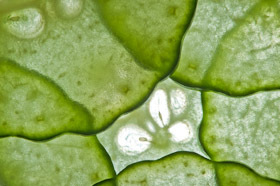 On the macro-shot, we see the curved outlines of cucumber slices overlaying each other several times, so that represents “curved”. I did also have a picture of the cucumber sticks on a chopping board, from before they were turned into salad. That would probably have made the contrast more obvious, but I thought the salad picture was a nicer picture. 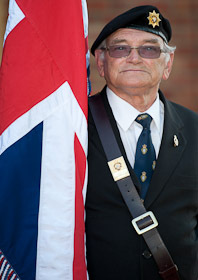 The common theme here is “soldier”, with the fluid movement from the long exposure of the marching cadets representing “moving” while John, standing perfectly still next to Union Jack, represents “still”. 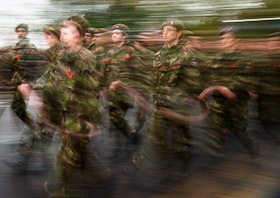 The assignment aside, I like the picture of the cadets for the symbolism I see here: Their hands appear to interlock as part of a long, strong chain while the lines created by the movement blur from their red poppies look almost like they are being targeted by the laser scope of a gun. Or maybe I’m reading too much into it! The theme for this pair is “leaves”. 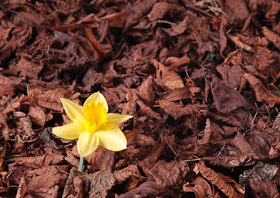 The fresh, young daffodil is surrounded by last year’s abundance of leaves, so this represents “many”. 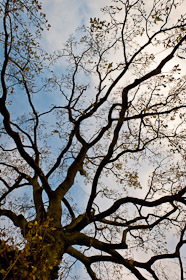 As a contrast, the branches of the tree, seen against the winter sky, appear naked and almost void of leaves, so it represents “few”. 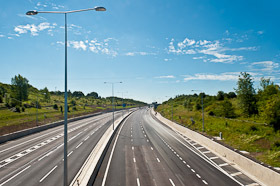 Two pictures of “roads”, with the 8 empty lanes of the M25 stretching across the frame and showing “broad” while Moore’s Place, where there’s not even enough space for a car and a pedestrian side-by-side shows “narrow”. I wanted to use the emptiness of the motorway to emphasize the wide expanse of concrete, so when it came to the narrow side street, I waited until there was several cars at the same time trying to turn into it. 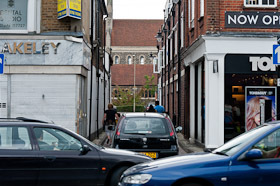 I think it gives an almost claustrophobic feel to the picture to highlight just how narrow the street is. The common theme between the two pictures is “water”. On the Southend picture, I tried to emphasize the vastness of the place in several different ways. 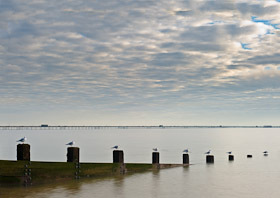 The line made by the posts with gulls lead the viewer’s eye across the wide expanse of smooth water, and the sky has been allowed to dominate to further give the impression of this being big nature. I had to cheat a little in Photoshop to give the pier an extra section to also make that reach across the frame and help give the impression of a vast “continuous” scene. As a contrast, the water drop that is about to hit the crown created by a previous drop shows that we’re here seeing the result of a slowly dripping, “intermittent” water source. 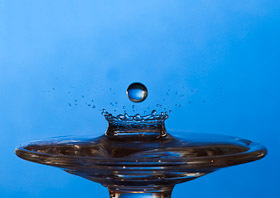 The water drop picture is actually two frames overlaid in Photoshop; that was easier than getting the timing exactly perfect to catch the drop just before the impact. The theme for this pair is the shape of the needle and the pencil; we could call it “pointed things”. When I planned the shots, I started with the pencil, thinking it was clearly going to be the example of something pointed. But then it occurred that when seen close-up, the tip of a pencil is actually rounded and worn, so I chose that to illustrate “blunt”. 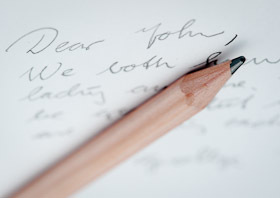 To bring the point home further, the pencil is placed on top of a blunt letter. In contrast, the tip of the needle is sharper and pricklier, so it becomes the image for “pointed”. 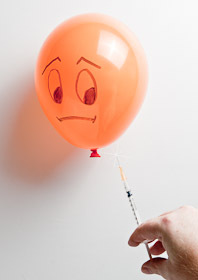 A picture of a needle on its own appeared bland to me, so the balloon was added for a bit of fun. The common theme is “birds”. 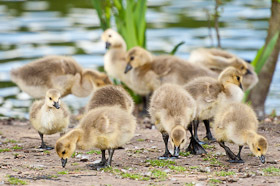 The cute goslings were not a pre-planned shot, but simply one of many from a nice spring day in the local park. They are obviously youngsters, so they represent “small”. The picture of the swan, on the other hand, was carefully planned and thought out. 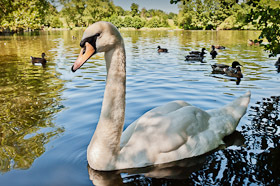 I wanted to shoot the swan from up-close with a wide angle lens to let the perspective exaggerate the size of the swan and make it appear vastly larger than anything else in the scene. I placed the monopod against the bottom of the lake and sat down to wait. The local wildlife didn’t much like photo equipment in their lake, so it took quite a while before any swan was brave enough to come as close as I needed it, but eventually this one did. Most friends recognised these two pictures as a pair, but some attributed them to “many/few” which also makes perfect sense. Two pictures of “children”, with the contrast being so obvious I should probably expect the political correctness police to come knocking on the door soon. 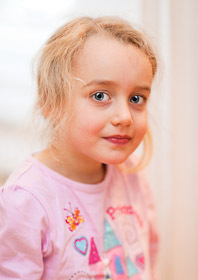 Gabrielle, with her straw-coloured blonde hair, light complexion and bright background is a high key portrait representing “light”. 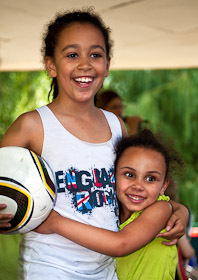 Grace, and her niece Ruby, with their dark skin and black hair represents “dark”. After trying my hand at a low key portrait of my dad for Christmas, I was trying to get Grace to pose separately in dark clothes for a low key portrait later on, but it was one of those things that just never happened. For the single picture demonstrating the contrast between “liquid” and “solid”, I made this photo of a water bottle. A bottle is normally fairly solid and hard, but although the bottle shape is clearly recognisable, it appears liquid. And it is. The bottle is actually made out of baby oil which can be forced into rough shapes that stay for a lot longer than if you try to make a shape out of water (I learnt this the hard way!) The label floats on top of the oil, but took a bit of time to get placed right, so it has started to soak up the oil. Looking at it again, I’m not sure whether I should have gone without the label at all, but that’s too late now. 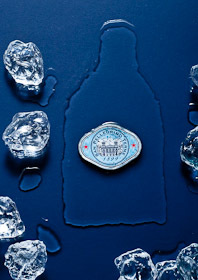 The ice cubes surrounding the bottle are theatre props made of plastic, so at least I didn’t have to work hurriedly in fear of them melting. During the assignment a lot has happened. After recovering from a traffic accident last year, I prioritised my time to look after Denise who was slowly losing her final battle against cancer. When she passed away, I spiralled into a depression that I’m finally beginning to believe I will eventually see the end of. So this assignment has taken me over 8 months to complete. Quite a lot of time for 17 pictures. From a learning perspective, one of the problems with that is that many of the thoughts I had when I made the pictures have faded, and a lot of the reasoning presented above is my current thinking, rather than careful notes made at the same time as the pictures. Still, some things are just the way they are, and I make no apology for the choices I made. Many thanks to the friends who took the time to share their impressions of the pictures with me. It really helped me realise just how easy it is to interpret the same picture in very different ways. Feedback from my tutor for this assignment can be found here. Hi. I am very sorry to hear that you have had such a difficult time and hope that things are better for you now. I think your collection of contrasts is very interesting – lots of clever ideas. I particularly like the scared balloon – I would never have thought of that. Look forward to following your progress going forward. In my defence I would like to point out that I can’t stand cucumber! No need for defending, Steve. It just proved the fact that maybe those cucumber sticks were even more tenuous than I thought. You nearly had me changing the picture so it became clearer, but with my speed over the last months, that would have delayed the submission by several weeks at least. And I was kinda keen on getting some traction again.